Turkish archers won 2 gold and 1 silver medals on the fifth day of the World Nomad Games 2018. 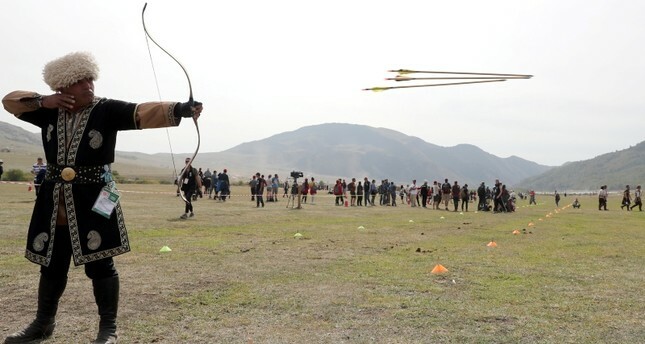 The Third World Nomad Games continued at Kyrchyn Gorge in the Issyk-Kul Region of Kyrgyzstan with archery category with the participation of 153 archers from 23 countries. Turkish archers Ibrahim Balaban and Canset Genel won gold medals while Fatih Yıldız won a silver medal. In the 3rd World Nomad Games, Turkey won 6 medals in total -- 2 gold and 1 silver medals in archery, and 3 bronze medals in wrestling. The games will end on Saturday. Turkey will host the Fourth World Nomad Games in 2020.